Le quatrième chapitre de Mutran Chronicles est disponible depuis 2 jours, et semble très intéressant. 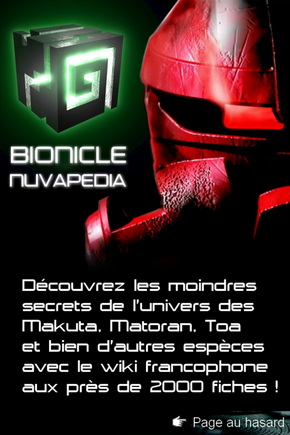 On y découvre que Makuta était avant de le renverser et de prendre sa place, le meilleur lieutenant de Miserix. On apprend également que c'est encore Teridax qui fut chargé de mettre fin à la Grande Rupture sur Metru Nui, environ 500 ans après la chute de la Ligue Barraki, et que c'est seulement suite à cela que Miserix fit assigner un Makuta à chaque région du monde. C'est ainsi qu'il attribua la surveillance de Metru Nui à son lieutenant, Teridax, alors que Mutran lui fut assigné en 1er lieu au centre du Continent Sud. There is nothing quite so... amusing... as Matoran at war with each other. There they are, with their powerless masks and their little weapons, trying to look formidable as they march into battle. One has to laugh. Of course, Makuta Miserix did not find the situation at all amusing. A mere 500 years after the defeat of the League of Six Kingdoms, the Matoran of Metru Nui had gone to war with each other. It had begun as a simple dispute over boundaries and trade between Ta-Metru and Po-Metru. It escalated when Po-Matoran sank some of the transport barges and Ta-Matoran destroyed a Po-Matoran warehouse with molten protodermis. Onu-Metru sided with the fire Matoran, Le-Metru with the stone. The Ko-Matoran attempted to intervene and were rebuffed, which pushed them into the Po-Matoran camp. Ga-Matoran efforts to remain neutral failed miserably and they eventually sided with fire and earth as well. Work ground to a halt as arguments evolved into pitched battles. Entire blocks of streets were badly damaged or destroyed. With no Toa stationed there, and the Turaga ineffective, it seemed as if nothing could halt the destruction. This suited me just fine, since I was using the chaos as an opening to slip new Rahi into the city to test their destructive potential. Miserix ordered his lieutenant to step in and stop the fighting. By this time, that particular Makuta was already contemplating the overthrow of the Great Spirit Mata Nui, so no doubt he saw this as an opportunity to show how well the Makuta could impose order. Unfortunately, his solution was to seal large numbers of the opposing armies in the Archives and unleash the exhibits on them. It was, needless to say, quite a mess to clean up later. And it did nothing to inspire great love for the Brotherhood in the hearts of the Matoran, though they certainly behaved themselves afterwards. Of course, much of what I have related here, I did not witness personally. No, after the war was well underway, I was given another job by Miserix. By the time the Archives Massacre took place, I was well to the south, heading for a meeting with a legend... a legend named Tren Krom.